Indeed, it’s widely conceded that part of the reason the unemployment rate has fallen is because a core of discouraged workers dropped out of the job search altogether. So for many listeners, Obama’s “turn the page” declaration will seem as out of touch as his claim that Islamic State’s advance has been stopped. The Bureau of Labor Statistics has multiple ratings for measuring unemployment. The official rating is the U3 rating, which is currently 5.6%. It was 7.8% when Obama took office and reached 10.0% at the height of the recession. It has always been the rating everyone references, but now that the economy is recovering, the Obama haters want to throw out an asterisk. What York describes is measured by the U4 rating. The U4 measures the U3 plus those who have stopped looking for work because current economic conditions make them believe that no work is available for them. That number is currently at 6%. It was 8.3% when Obama took office and reached 10.6% during the height of the recession. Finally, there is another rating, the U6 rating. The U6 is probably the most accurate measurement of unemployment. It is a combination of all ratings plus part-time workers who wish to be full-time. That number is currently 11.2%. It was 14.2% when Obama took office and reached 17.1% during the height of the recession. Under the Obama administration, every rating of unemployment is better than it was when he inherited an economy hemorrhaging jobs. To say that the economy turned the page isn’t out of touch; it’s factual. To be out of touch is to want to go back to the incompetence of the Bush administration. He inherited a U3 of 4%, a U4 of 4.2%, and a U6 of 7.1% and managed to double unemployment. Your reader who discusses alternative measures of unemployment – U3, U4, U6 – misses something important: people who have not looked for work in the last 12 months are NOT counted in ANY of these measures. U6 includes all “marginally attached workers.” “Discouraged workers” are a subset of the “marginally attached.” “Marginally attached” have not looked for work in the past four weeks, but HAVE looked for work in the last 12 months. So if you have not looked for work in the last 12 months, you’re not even “marginally attached,” which means you’re not counted in ANY of U3, U4, U5, or U6. The BLS is not “cooking the books,” as the right-wing conspiracy theorists routinely assert. Instead the BLS is using statistical formulations designed to convey useful data in normal times – but these simply aren’t normal times. Yes, there are more jobs now than there were when Obama took office. But the jobs growth has not nearly caught up with the population growth since January 2009. Thus there are more jobs, but not nearly enough jobs to employ the same % of the population. (Graph, and explanation, here.) Thus the labor force participation rate has dropped. 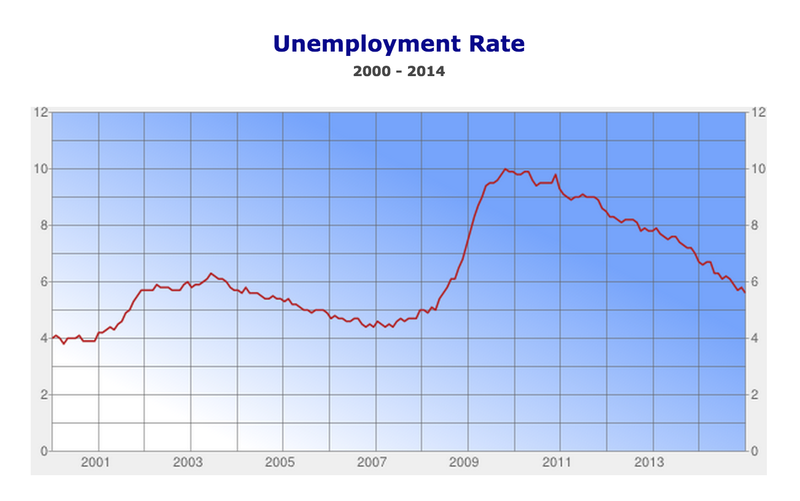 That’s the real upshot of the graph, and that’s what the BLS unemployment measures don’t capture. If you Google “long term unemployed” you’ll find that they form a historically high share of the unemployed. But it’s not clear these articles are really catching the full extent of the problem -because it’s not clear whether they’re starting with the Bureau of Labor Statistics measures of unemployment, like your reader. Any discussion that starts with the various BLS categories is missing those who haven’t looked for work in the last 12 months. For those, you have to look at the labor force participation rate – which remains historically low, and shows no sign of improving. The aging of the Baby Boomers accounts for about 40% to 50% of the drop in the labor force participation rate (links here, here, and here). The most likely reason for the other 50% to 60% of the decline: lack of work. Finally, simple supply and demand. If a significant number of people were dropping out of the labor force for ANY reason other than lack of work, then we’d see wages rising significantly. But inflation-adjusted wages remain flat to barely growing. That’s why people are unhappy: wages are flat and there’s still not enough work to go around. The relatively good BLS unemployment statistics can’t change this. Previous Previous post: Leo Strauss, Man Of Peace?